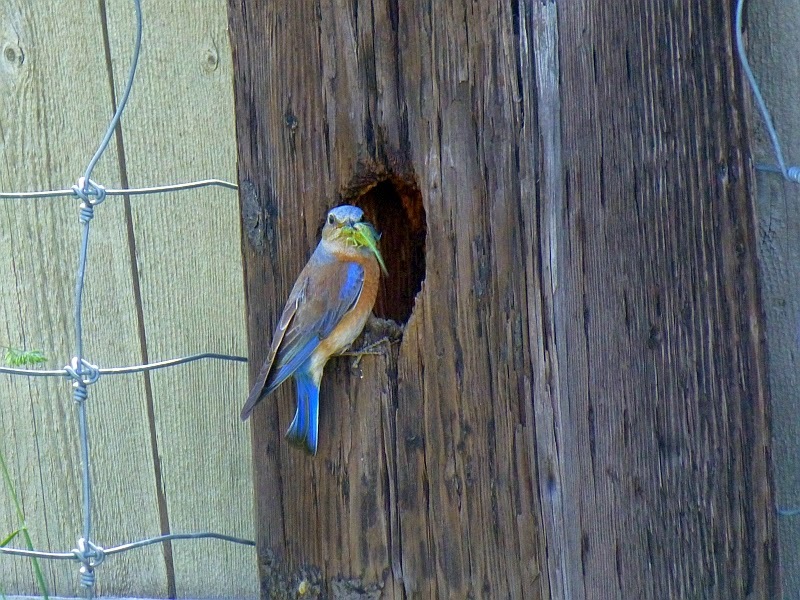 In one of the corner posts of the garden, we have a pair of western bluebirds who are nesting. We figured this out after seeing the pair hanging around the area behind the barn and not leaving. We try not to disturb the birds too much, but since we've been doing a massive amount of garden work, we're often in close proximity. 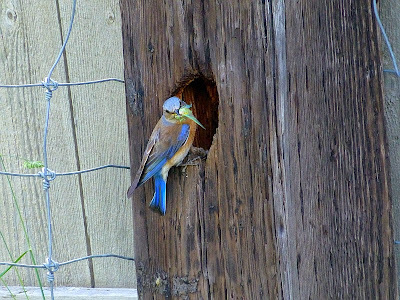 And once in awhile I can't resist sticking the camera in the hole (it doesn't quite fit) to see what's in there. There were at least five eggs, probably six, but since the camera wouldn't fit all the way, I wasn't sure. 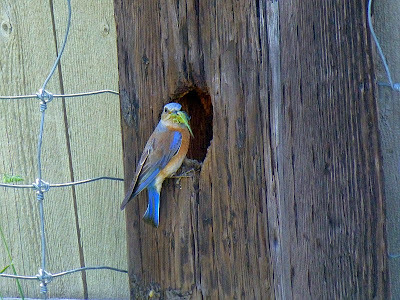 The eggs are now hatched and the nest is filled with wide-mouthed young 'uns. 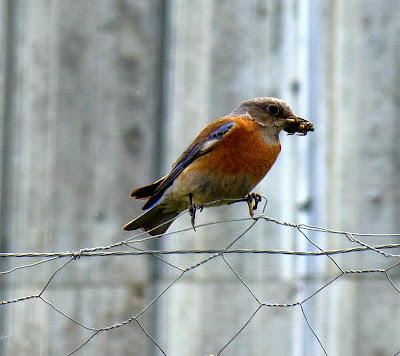 Now the parents' days are consumed by finding consumables in the form of yummy insects and worms. Looks so durned tasty, doesn't it? 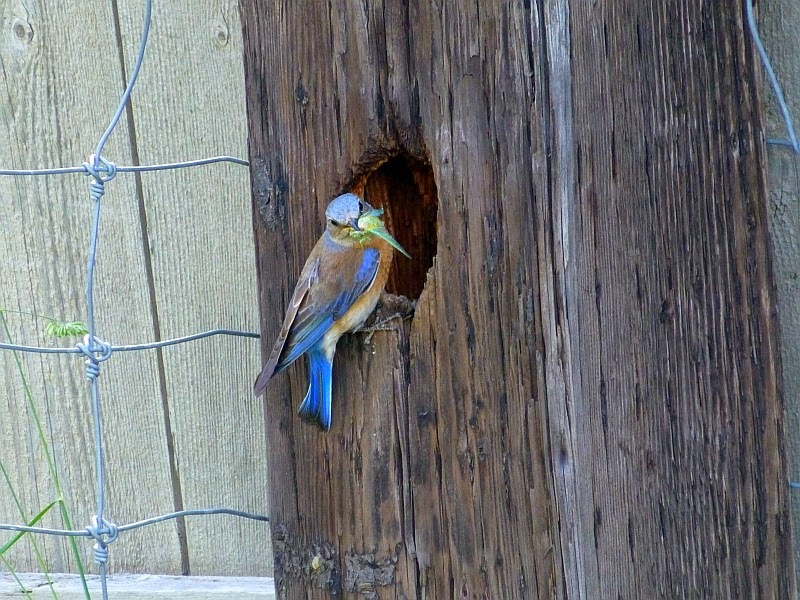 Sometimes I catch both parents with their mouths full. 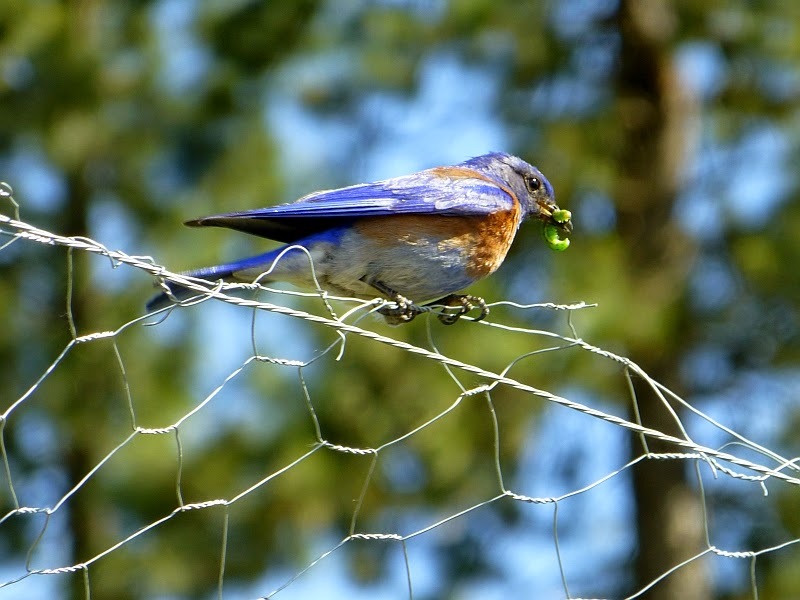 The Wikipedia article on Western Bluebirds notes, "During the breeding season, bluebirds are very helpful with pest control in the territory surrounding the nest." Natural pest control! I like it! ...and fly off to look for more. Don't we love our blue birds!! Lucky you. Patrice, we are interested in putting in a pond on our property. We are north of you but not in your county. What hoops were required for you to jump through in order to put this in? We've checked with the county here and only if it will be near a slope or another body of water, but I'm a bit nervous with something this large. Thank you. Great pictures, Patrice. They are very beautiful birds. Wowwie. I can't believe those two photos of inside the nest! What a wonderful photo essay. I'm so glad I rediscovered your blog. I had followed a couple of links here in the past but never saved you in my favorites. Now I have. You have some great preparedness articles and some great feel good posts. This article was a great distraction from everything else. I will be here daily. Great blog. They are such beautiful colours. Great photography, enjoyed this post. Wow, great photos. What awesome colors! Thank you for sharing. Isn't it refreshing to see 2-parent families working together. Love these photos. My 5-year old daughter also enjoyed them. We just finished the chapter in Burgess Bird Book on bluebirds and robins and this was a very good visual! We have wrens nesting for the second time this year in a hanging basket just outside our back door. The adults pay very little attention to us. Currently they are making trip after trip to feed their greedy fledglings. The earlier hatch consisted of five. From the noise there may about the same number this time. We really enjoy seeing the busy parents.